Home > General > Divorce made easy?? I am writing this piece fully prepared to receive sharp reactions from the current generation of young and prospective brides and grooms. I had earlier tried to defend arranged marriages and ended up supporting marriages arranged not by parents as I initially planned but that arranged by the couple concerned. Who knows if I would fail again and end up endorsing the opinion of the very youngsters whom I plan to criticize in this post of mine? I would make a very bad defense lawyer so never ever hire me to plead your case. Sonu was a young man in his early thirties when he dated a girl and decided to marry her. They got to know each other through a matrimonial site and had met on quite a few occasions. The girl belonged to the same community as him and his parents were overjoyed that their son did not choose to marry a girl from a different state and culture. The two shopped for their wedding and planned a trip to a holiday resort in Kerala after the marriage was solemnized. Since Sonu’s mother’s health was cause for concern they had asked the girl’s family to come over to Jamshedpur and made arrangements for the wedding ceremony to take place in a hall close to their home. We were among the invitees but since the wedding was to take place at night we left after dinner a little after the groom was welcomed by the girl’s family to the venue of the marriage. We next heard that the marriage had taken place but the girl refused to accompany the groom to his home. She had canceled the trip to Kerala as well as her leave and returned to Mumbai to resume work at her office. Reason? Well, if you ask me I would say that the reason given by her did not merit a divorce but my young readers may think otherwise. It so happened that the boy’s 2nd and 3rd toes on his right leg were fused and the girl got to know of it only after he removed his shoes for the marriage rituals that took place. She felt that he ought to have told her about it. The girl’s family created a ruckus over the issue accusing the boy’s parents of covering up vital information and left the place without performing the ‘milni’ which involves a kind of introduction and interaction between the families. The girl has now filed for a divorce which may be granted in all likelihood. The boy in question says that he had never felt inadequate or handicapped because of his condition. He got a doctor to examine him and confirm the fact that his congenital defect was not hereditary and produced certificates of the prizes he had won for athletics in school sports and tried his best to save his marriage. Even if for a moment we agree that he ought to have told the girl in question of his handicap and suddenly noticing that his toes were fused must have shocked the girl, did the girl have to take the extreme step of calling off the marriage? If she was so upset why did she not object before the marriage took place? I hear that the girl’s family is asking for compensation. Was this a ploy on their part to fleece money out of the groom and his family? The girl has no parents and it is only an older brother and a step mother she can turn to for advice. The brother does not earn well and it perhaps suits him to have a high salaried well employed sister supporting his family. The step mother may not be concerned about her future. I feel that the initial shock was justified but there was no need to call the marriage off. The issue could have been sorted out. What do you think? I definitely don’t think there was enough reason for all that hue and cry, and I tend to agree that the reasons were possibly some of the others that you mention. A Canada based nephew of mine was married to someone who created a massive issue out of nothing once she reached Canada with him; it turns out she was only after Canadian citizenship. On the other hand a friend of mine was in love with a girl, but sadly lost a leg in a train accident. We all waited with bated breath about how the girl would react. She fought with her family and other ‘well wishers’ and married him. They are married for years now and parents of two lovely children. I agree the boy should have told the girl in advance – the issue concerned is very trivial and certainly nothing to be shameful about, but it is no reason to call off the marriage ! And like SunilIas sir mentions what if something were to happen just before/after the marriage ? In many cases the couples just jump the gun and leave everyone around them (including themselves) in emotional quagmire. What could have been sorted out with a heart-to-heart talk becomes a case of washing dirty linen in the public. It does seem like a very trivial issue. I can’t help wonder if the girl just used this as an excuse to back out of the marriage…But this is rather rare, isn’t it? Most divorces happen because of far more serious issues, is what my impression was..
Well, I am leaning towards agreeing that Divorce has become a viable option these days what with the frequency and familiarity with it. That said, I met three of my school mates recently who all chose to leave, coz the spouses in question were not worthy and were in fact jerks. They did try and fix the situation before opting out. it was nice to note that many among you agree with me and feel that divorce for trivial reasons ought to be avoided and the case I mention is one such case. If as RADS says, one’s spouse is a jerk and the relationship is not longer sustainable it would be best to part ways. This applies to both men and women. However, while society has accepted a woman’s divorce from an abusive husband I am not sure if it would react in the same manner if a man opted out of an unhappy marriage. This perhaps stems from the fact that women are portrayed as devis, dainty creatures and what not – they can only be abused they can never be abusive. Yet I know of cases where the man has suffered for years in a marriage unable to share his grief and/or find a solution. I would be the last person to find fault with the option of breaking a marriage if such is the case. I am always at loss, when we look for reasons for divorce. Therefore, I find this reasoning a little appalling. I feel it is an Indian need to have a well articulated reason for divorce. If the girl was to say, “I am not able to love this person” or “I dont feel that that I want to be in this marriage” or “Somehow I don’t think I want to spend the rest of my life with this person”, Will society be ok with it? Not at all. Her family and her community will torture her, to come out with a reason. A concealed extra finger is one such reason. I like the girl’s attitude, that way. Awesome. If you dont intend to understand my predicament, so be it. Here’s your reason, a finger! Also, you were an only an invitee.I am not sure, if you would really know what the actual issue was, for the girl. What is said, outside, are often cover ups for the real problem. Should she have said it before marriage actually happened? My God! You seem to undermine the power of our wedding rituals and the whole paraphernalia of an arranged marriage in India. In such an arranged marriage, the girl and the boy must have only spent very little time with each other. I am not sure, if all girls would have the heart to call off a marriage even if they get to know about “reasons” (whatever they may be) even, days before the marriage. Most importantly, I think, we need to trust a girl’s choice. After all, I dont think, many of us, get divorced just to get the taste of it. She is taking a choice, which is far more difficult than staying in the marriage for the sake of it. She knows that such allegations will be thrown at her. In spite of that, she takes a decision, because she does not want to remain unhappy and make someone else unhappy for the rest of their lives. I think, she knows what she is doing. The reason – I think, is irrelevant. preeti:That was a different view. You are right about a woman being put off by the person chosen by her parents. In this case however, the couple met first and elders negotiated after the children expressed their desire to marry. So their marriage does not qualify to be the traditional arranged marriages that take place in India. It is also not the typical love marriage. It was arranged by the boy and the girl. Second, we are not talking of a girl from a remote village in Bihar who could not stand up against her family. She was employed in a multinational company in Mumbai and quite capable of voicing her dissent. Third, if she was under any kund of pressure from her family, they would not have created a ruckus over his fused toes. They would have tried to convince the sister to stick to the relationship. To my mind it appears that the girl felt let down and reacted. The boy ought to have told her about his deformity on the few occasions that they met before marriage. However, I still feel that the girl ought not to have gone through the rituals if she found his condition repulsive. I still disagree. Especially regarding two things. One, about the need for a reason that is palatable for outsiders who have no clue about what really happened. I am sure, she has a reason that is good enough for her and she definitely does not owe the society one. And therefore, we shouldn’t be judging her on this regard. Also, I don’t understand this overbearing importance to the “ritual” of the wedding. We get married, because we want to live with someone and have a life, that we want to lead. The wedding ritual is one, that enables that. To put it the other way around, is not acceptable to me. Because, you went through the ritual, stay with the man, or woman, is not reasonable at all. Sometimes, it could have been a mistake. Maybe she made a mistake in agreeing to the marriage and later changed her mind. Maybe, in the days that led to the wedding, she felt that she would not be happy with this man. So, just because a wedding ritual, happens, does she have to live a miserable life for the rest of her life and his! Even, as I say this, I know it is first world woman’s problem. A poor woman, may not have this choice and I would look at man doing this differently. I know that I have this choice, because i am financially independent, but I am not going to be apologetic about it. As you mentioned, because she is a woman working in a MNC, she obviously feels the need to marry someone that she loves and respects and not because she needs security as in a traditional marriage. Second thing I would disagree with you is the ability of a girl working in a MNC to shout out in the middle of the rituals that she does not want to marry the guy. I dont think, I would be able to do it either. As I said earlier, I think you underestimate the power of patriarchy in families, customs and rituals. I don’t think calling off a wedding is an easy task, even for a woman working in a MNC. It may be true that a lot more women are doing that, but it is still not as easy as you seem to imply. In this case also, yes the girl and the boy met through a matrimonial site and met a few times. Thats all. It’s not as if they spend years together, having disagreements, and decided to get married over several discussions. Even in those cases, haven’t you heard of commitment phobic men? My only point is, I dont think, “finger” is the reason. Things accumulate, there could be a million other matters and we have no clue of knowing what actually went through her mind. Hence, we should refrain from the judgment, imho. The reason for writing this post was to get the views of your generation. I wish more from the current generation of prospective brides and grooms had come up with their take on the issue. I agree that the fused finger was not the issue. Having gone through all your comments, my only question is whatever the reasons the girl could have to break the marriage just after the ceremony, it is not the boys fault and I hope u will agree with me that the any sensible person would understand that no one in this world would forcefully bring any form of disformity on himself/herself. The author writes ” I hear that the girl’s family is asking for compensation. Was this a ploy on their part to fleece money out of the groom and his family?” Do you find any justification in that? What do you have to say regarding that? I dont see this as a girl vs boy issue. Therefore, I dont see it as the boy’s fault either. It is very possible that the boy and his family did not consider himself to be disabled by any means. About whether it was justifiable for the girl’s family to ask for compensation, I cant say. As we see from the article, the author is an invitee of the groom and therefore would have access to only the groom’s story. Therefore, I feel I dont have enough information to make a judgement. If they were indeed asking for compensation for concealing information about the finger, I would say it would be justifiable if there was an intentional effort to conceal the information. On the hand, if there was no intention to conceal the information, it may not be fair to the boy. But only an indepth investigation can help us evaluate such things – maybe not even that. I read the blog post and the comments with great interest. As a divorced woman myself I’m well aware of the accusations that are rampant about divorce, the suggestions that its the ‘easy’ way out when that is quite the contrary. The suggestion that the younger generation is divorcing more easily and quickly was met by me with a cheer. If you don’t want to remain married you certainly shouldn’t just to keep society, or your parents happy or to keep the statistics of divorce down. Its absolute hell to live in a marriage that’s not working. Also, the law is so convoluted that it takes years to get a divorce. 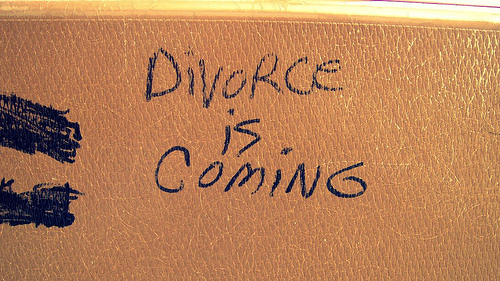 There are countless people who’s lives are on hold simply because they’re waiting for a divorce. Is the option then – don’t file for divorce but continue upholding the institution of marriage? I’d like to say about the particular case that’s been cited here – the problem seems to be with the institution of arranged marriage. Without an in-depth knowledge of each other, relying on their backgrounds, castes and parents’ ‘superior’ wisdom people agree to marry someone they hardly know and certainly don’t love. Do you think that a couple who knew each other well, who accepted each other and admired many traits in each other would have cared about toes and fingers? Certainly not. Arranged marriages belittle human beings, turning marriage into a cattle market where a cow or a bull can be sent back because of a crooked horn. Mutual respect is the first basis for marriage, not mutually agreeable backgrounds. That’s completely lacking in arranged marriages. I salute the girl for her path breaking decision and laud her for being so brave. I hope the groom overcomes the feeling of inadequacy that this incident must have generated in him. I hope for a day when young people have a more sincere outlook to marriage, choose carefully and wisely and, if they make a mistake, have the option to get out of the marriage instead of ruining their lives with a stoic attitude. And I hope a day dawns when divorce loses its stigma. Although, I can’t agree with the girl’s stance of calling off a marriage just beacause of a light deformity, but I agree with your view about arranged marriages. Being a divorcee myself who walked into an arranged marriage based on “superior” parental wisdom ignoring my own instincts, I feel that marriage in itself has become something of a farce. Majority of people walk into it without the least intention of supporting each other through everything, without any feelings of honour or dignity at all. Would you agree i a boy wants/demands divorce the next day or within days after the marriage without these reasons like in compatible/silly things? Why im asking is, i agree that women might find it difficult to opt for divorce, but for men…even for no fault of theirs, they have to face the non sense like these when the girl decides to walk out of the marriage without any proper justification. After rating Thumps down to Preeti as a mark of disagreement I started thinking from the shoe of the Girl. Had it been an arranged marriage forced upon her, she might have clung to some lame excuse to get free. But it was her choice. The gentlemen who was so honest and lovely failed to state about his fused fingers genunely beleiving that does not matter, but when she found out and asked him , He might have exploded saying ” The fingers does not matter , what matters is the D—” You never know. In may cases how men behave after marriage will be markedly different form before marriage. I agree with you Preeti, Let us not be judgemental, respect her decision. Please try to understand that its not about joint fingers.. its about the trust ! Me being a victim of the similar issue can understand where is she coming from. It was not a complete old style arranged marriage, two people spoke to each other & then decided to spend the life together. They must have shared the details like finances, families, their likes & dislikes etc. So why not such a important fact about your own body. It starts with this small lies / hiding facts & later turns into big web of lies. Families tend to hide things thinking once the wedding ceremony is done, girls are stuck & accept whatever comes along as their fate. I wish i had the courage to walk out as soon as the first lie was revealed to me.. Kudos to the girl !